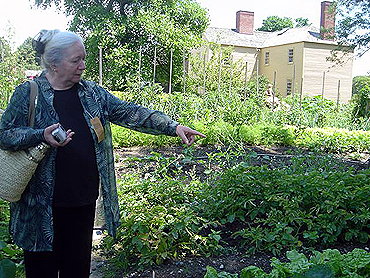 Last Friday, at the suggestion of Betsy Devine, who blogs at Betsy Devine: Now With Even More Funny Ha-Ha and Peculiar and lives in Cambridge, Massachusetts, we met up at a fascinating museum in Portsmouth, New Hampshire named Strawbery Banke. Yes, that spelling is correct. The museum is a collection of preserved and restored homes built in the 18th and 19th centuries which was an ongoing community until 1960 or so, saved from urban renewal demolition then through the efforts of a local librarian. 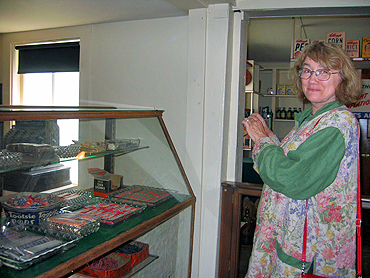 The museum is so large – a small town in itself – that I will need to return one day soon for a good look at the oldest homes because on this visit I was magically whisked back in time to my 1940s and ‘50s childhood. The period was irresistible, at once both familiar and old-fashioned. Who knew one could live long enough that artifacts from one’s earliest years would become items of historical interest? Even after World War II, women dressed up to go shopping. My mother always wore a hat when we went to the store. One can’t help wondering how the current Iraq War might have been different if the people of the U.S. had been asked to participate in important ways as they were during World War II. Every American regardless of age was given full rations each month so my mother, since I was born in 1941, had what amounted to a double ration allotment and used the extra at holidays to entertain friends. 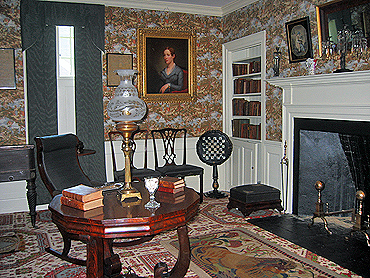 So you don’t think I entirely ignored the oldest and largest parts of the museum, here is a shot of the parlor in the Aldrich House, built in 1797 and refurnished as it was in 1908. Several times during our tour, Betsy and I ran into what is, apparently, the Strawbery Banke resident cat. 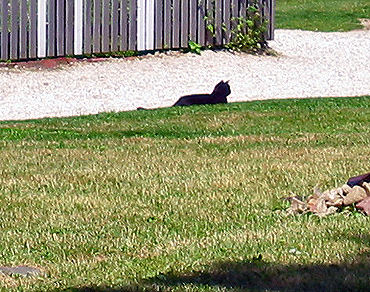 The last time we spied him, toward the end our tour, the cat was racing away from a museum worker carrying a baby bunny in his mouth. That sounds like a wonderful place to visit. I must put it on my wish list. I find things I once owned and discarded or sold for pennies on sale now for big bucks in antique stores. That's another odd sensation of time travel. Ronni, what a pleasure it was to wander there with you! Alas, many of my photos came out blurred--thanks so much for sharing your excellent collection! That place sounds right up my alley and if I ever get to NH, I will go there. 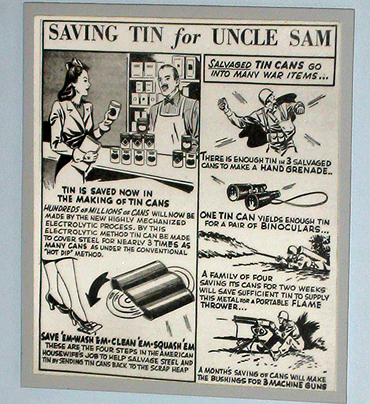 I have a small collection of 1940's kitchen goods and I love seeing other things like it. 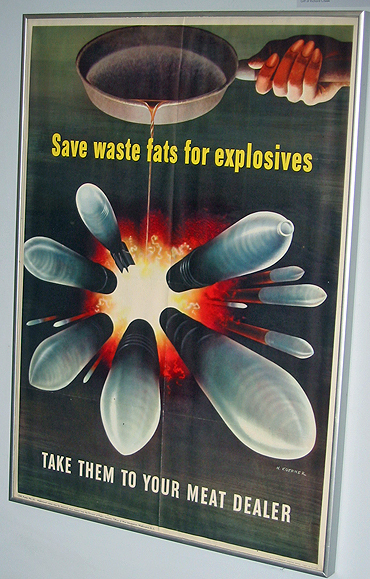 I remember rationing well as a small child, and black outs too. Wonderful pictures! I have never heard of the place, but would love to visit. One interesting note: I guess ageism has always been with us. 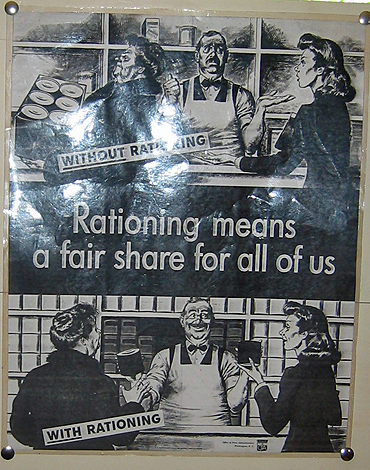 Look at the rationing poster. The older woman is the “greedy” one that the younger woman has to be protected from – through rationing. I have contacted bloger help by email but to no avail. Awesome, Ronni!!!!!!!!!!! I love old sthings like this! Fascinating place to visit. What fun it must have been to roam around through there. Recall N.H. from the sixties as the most beautiful of the northeastern states. Betsy has a interesting blog, too. I enjoyed this post and the tour of this museum. Even though I don't dress up myself anymore, sometimes I miss the days when we cared more about how we looked when we went out in public. This is especially true when I see a midriff showing that would be best left covered or a rear exposed atop droopy drawers. It is always a pleasure to see church-goers who continue the custom. I was born in 1944, so I don't remember much of the war effort. However, I DO remember the hats and white gloves. Thanks for alerting me to this wonderful museum..it will be on my list of things to see if I ever venture up North from Tennessee. What an incredible place, Ronni. I haven't been visiting lately, but I'm always jazzed when I do. Ah, Ronni, what fun you must have had. To those of us who were around to eat Cheerioats, it was traumatic when the name was changed--took a few years to pronounce the new name correctly. 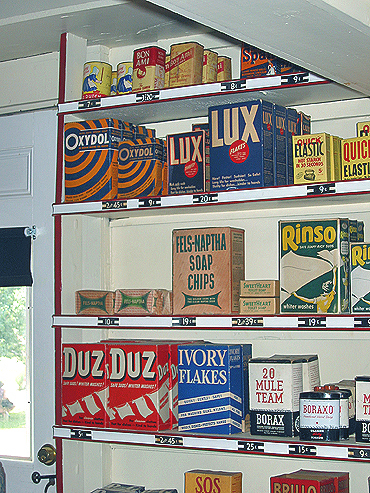 I miss seeing soap flakes. If I recall correctly, both Ivory and Lux made the flakes, in addition to Ivory Snow and Lux powders. The flakes made wonderful finger painting mixtures. Another wonderful trip down memory lane. 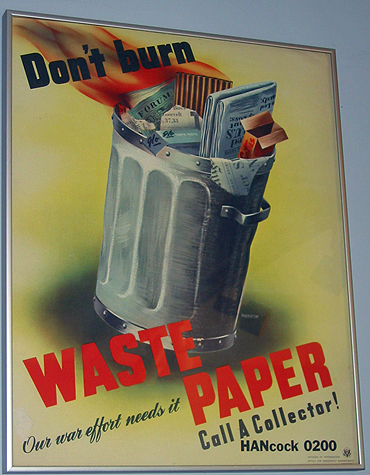 Somewhere in some box I still have my WWII ration book. 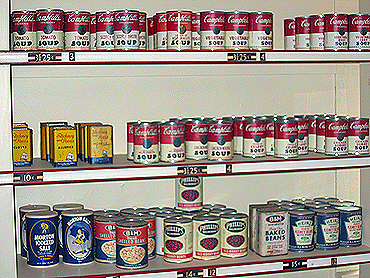 Does anyone remember Dr. Lyons tooth powder that came in a can? 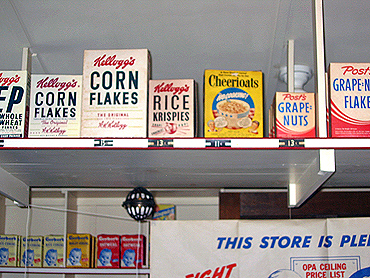 Great photos of the store...but in my memories, all cereal boxes had Magic Decoder Rings, or something equally fascinating, in them. What was the point of eating the cereal if there wasn't something hidden in the box? Nutrition? Nah!